Jakub Schikaneder (1855–1924), Murder in the House (1890), oil on canvas, 203 × 321 cm, Národní galerie v Praze, Prague, The Czech Republic. Image by Ophelia2, via Wikimedia Commons. In my quest to locate nineteenth century artists who might be described as ‘naturalist’, I have come across a painter whose work has variously been described as Symbolist, Realist, and Naturalist, the Czech Jakub Schikaneder (1855–1924). I hope that you will enjoy seeing some of his paintings in this article and the next. Schikaneder was born into a fairly humble family in Prague, in 1855. In 1871 he started art studies in that city, moving to Munich in the mid 1870s. He exhibited for the first time in Prague in 1876, and visited Paris in 1878. When he had completed his training in 1879, he returned to Prague, and a couple of years later was among the artists and craftsmen responsible for furnishing and decorating the royal box in Prague’s National Theatre. Jakub Schikaneder (1855–1924), Bylinářka (Herbalist) (1882), further details not known. Wikimedia Commons. His early painting of the Herbalist from 1882 shows a woman gathering wild flowers in a field, presumably for the preparation of herbal remedies. It reminds me of the ‘social realism’ of Millet. In 1885, Schikaneder was appointed to the School of Decorative Arts in Prague, and rose to direct its special school of botanical art. Jakub Schikaneder (1855–1924), The Sad Way (study) (1886-87), further details not known. Wikimedia Commons. He continued to paint the rural poor. 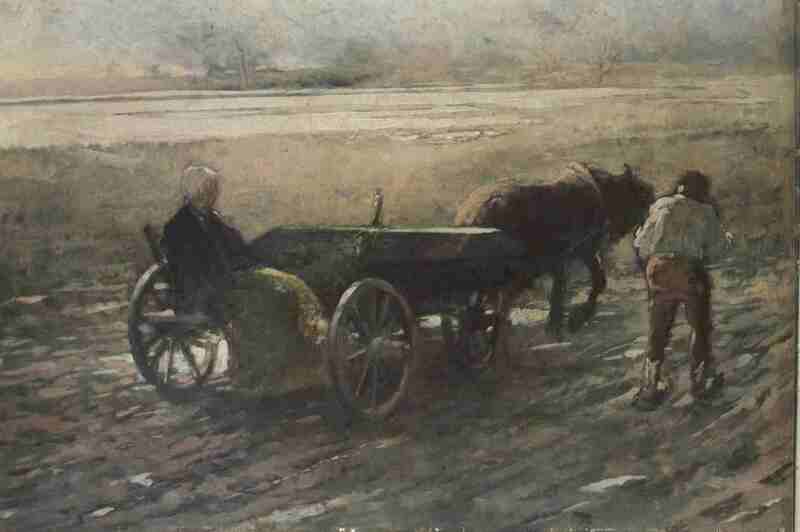 This study for The Sad Way must have been made in 1886, and shows a woman riding on the back of a cart which is carrying a coffin. 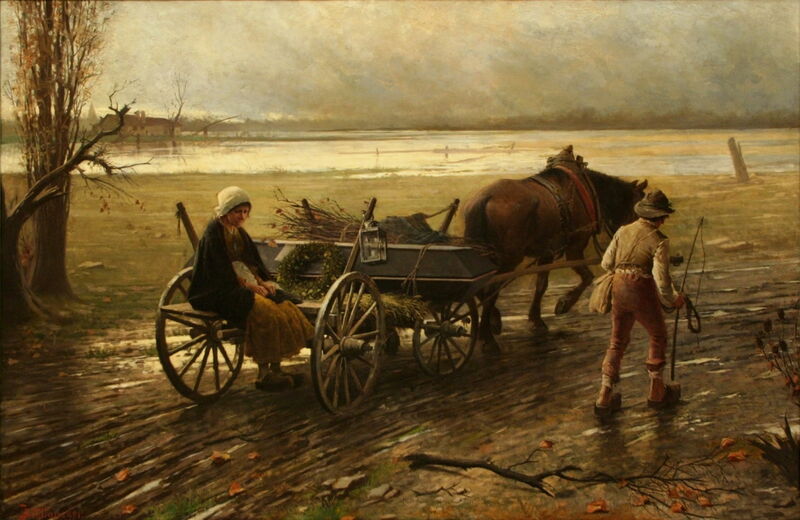 Jakub Schikaneder (1855–1924), The Sad Way (1886), oil on canvas, 141 × 217 cm, Národní galerie v Praze, Prague, The Czech Republic. Image by Ophelia2, via Wikimedia Commons. The full details are revealed in Schikaneder’s finished version of The Sad Way from 1886. A single rather weary horse tows the cart on which the coffin rests. The woman, presumably a widow before her time, stares emptily at the rutted mud track, as a man walks beside them. Both are wearing wooden clogs. In the background is the floodplain of a river which is in full flood. It appears to be in the late autumn, with the last of the brown leaves remaining on the trees. Schikaneder’s world is barren, bleak, and forlorn. Jakub Schikaneder (1855–1924), Plečka (Weeder) (1887), further details not known. Wikimedia Commons. 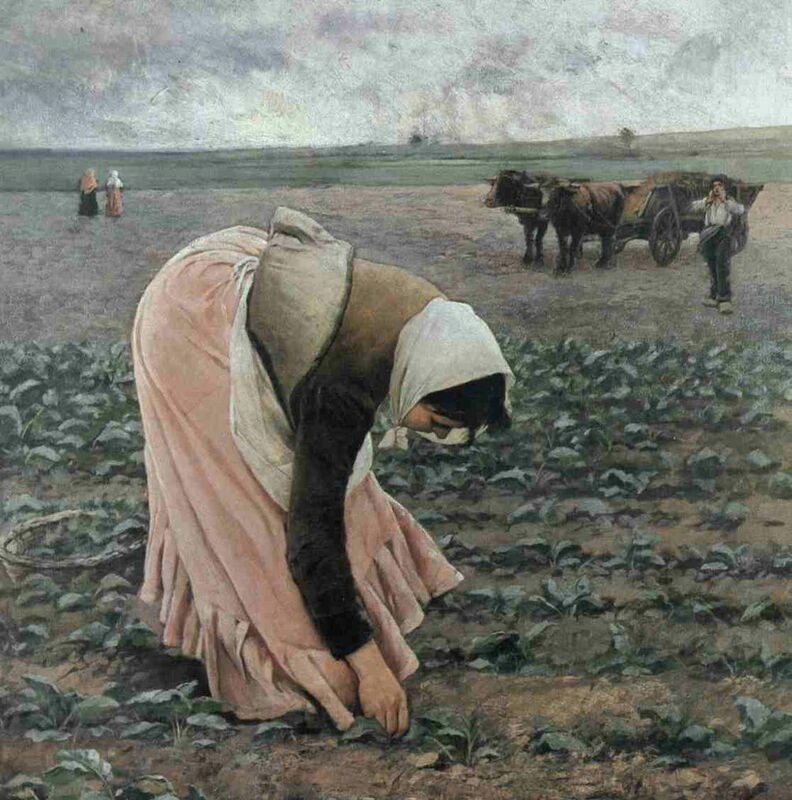 Weeder (1887) shows a woman bent double as she pulls weeds from a young crop, and would pass for a ‘social realist’ work from the likes of Millet or Breton. There is a little more story here, though, as a man standing next to an oxcart is calling to the woman from the distance. Jakub Schikaneder (1855–1924), Company on the Terrace (1887), oil on canvas, 80 x 130 cm, Středočeská galerie v Praze, Prague, The Czech Republic. Wikimedia Commons. 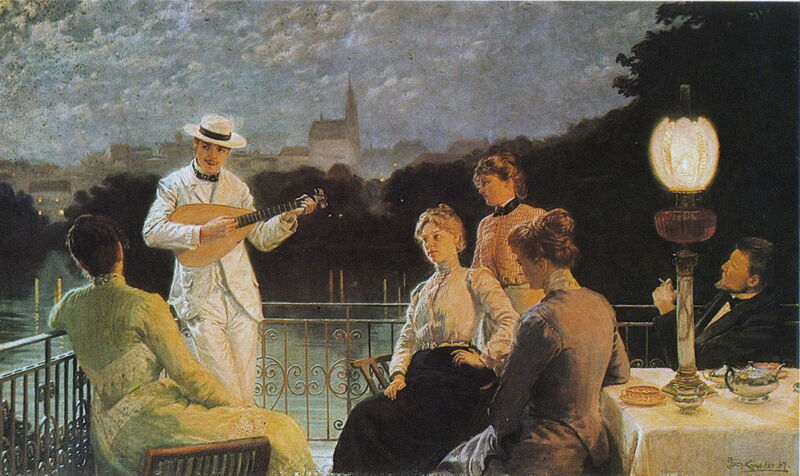 Schikaneder’s Company on the Terrace (1887) is a complete change. It is evening in a city, and a group of affluent diners are sat on a terrace by the river. A young man is singing and playing a lute – an odd choice of instrument for the period. The diners are listening intently to the singer, as if following the words of his song. Jakub Schikaneder (1855–1924), All Souls’ Day (1888), oil on canvas, 139.5 × 220 cm, Národní galerie v Praze, Prague, The Czech Republic. Image by Ophelia2, via Wikimedia Commons. 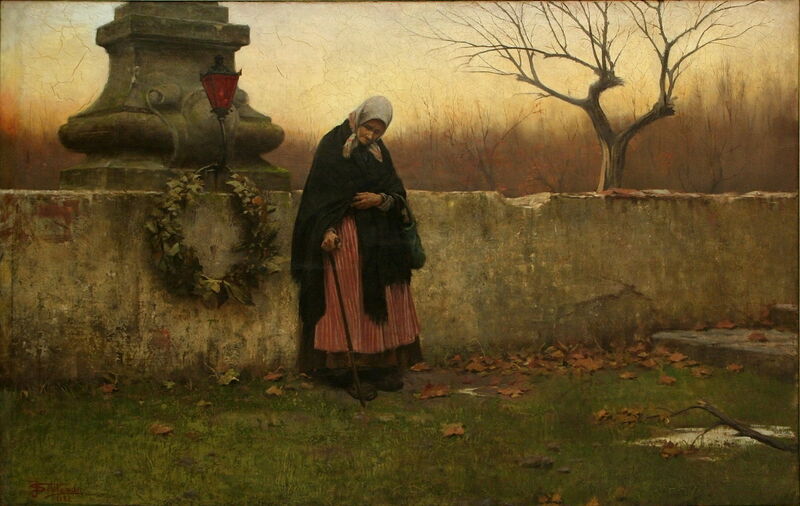 He resumed his theme of loss in All Souls’ Day (1888). An elderly woman stands alone holding her walking stick, her back against a low wall. It is late autumn, and there are brown leaves scattered over the ground. She looks down in thought, presumably reflecting on her dead husband. To the left of the woman is a lantern on which hangs a commemorative wreath; behind that is a stone monument. Jakub Schikaneder (1855–1924), Stařena s dítětem (Old Woman with Child) (1886-90), further details not known. Wikimedia Commons. 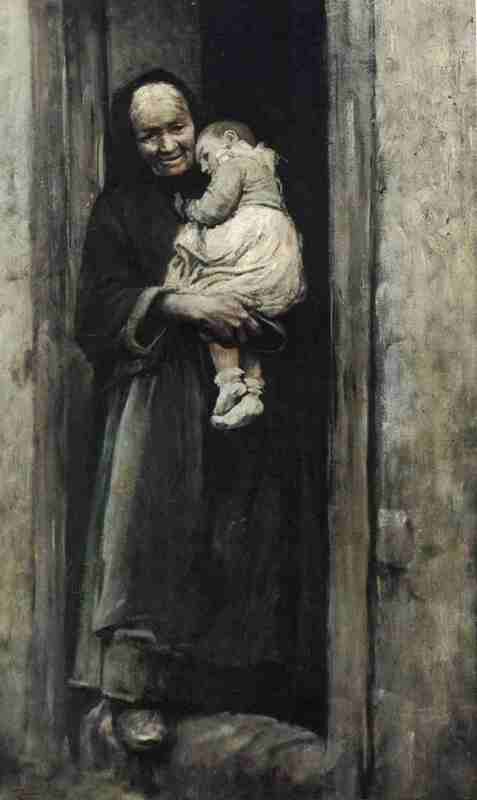 Old Woman with Child (1886-90) shows another elderly woman, here stepping out from the doorway of a poor home, with a young girl resting on her shoulder. 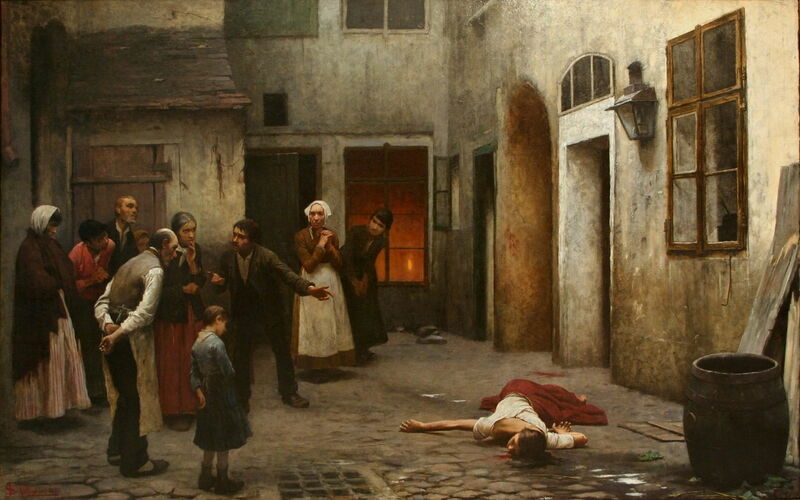 Murder in the House (1890) is Schikaneder’s most famous painting, and was very popular when it was first shown in Berlin that year, and at a Jubilee exhibition the following year in Prague. Set in a dark courtyard in the Prague Jewish Quarter, its location is not far from the apartment in which Schikaneder lived from 1872 until he married in 1884. In a courtyard between cramped and run-down town dwellings there is the body of a young woman sprawled on the rough cobbles. Blood by her head suggests that she has been stabbed in the neck, perhaps, and there is another bright splash of blood by a doorway behind her. On the opposite side are ten people, ranging from a young girl to a balding and stooped workman with a leather waistcoat and grubby apron. One, a younger man, stands in front and is talking and gesticulating expansively, as if explaining what happened. The others are staring at the woman’s body on the ground. Behind them is a large window which is lit with the flame of an oil lamp, turning it bright red. Schikaneder makes each of the figures a unique character, and leaves its narrative open for the viewer to speculate over. 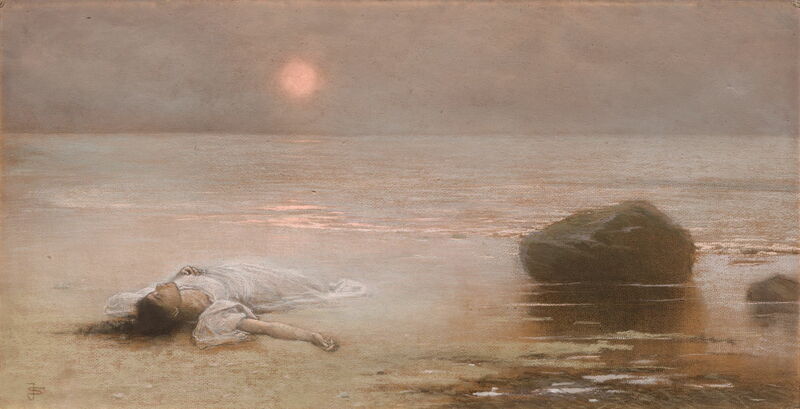 In Schikaneder’s pastel of Utonulá (Drowned Woman) from 1893, another young woman in a white gown is resting dead on the sand of a beach. Her legs merge in the mist into the sand, making her appear almost ethereal. The sea is calm, the sun rising. There is no wreckage, no explanation for her drowning, just a calm and emptiness. This completes his series looking at the tribulations of a woman’s life. In 1896, Schikaneder was appointed a professor at the School of Decorative Arts. During this decade, he travelled extensively in Europe, visiting France several times, and Italy. In 1895 he visited England and Scotland with a colleague. Jakub Schikaneder (1855–1924), Kontemplace, Mnich na mořském břehu (Contemplation, the Monk on the Seashore) (date not known), pastel on paper, further details not known. Wikimedia Commons. 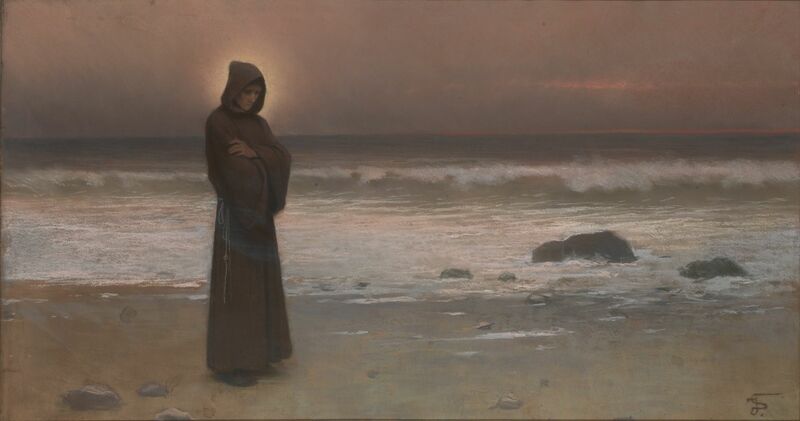 Schikaneder’s undated Contemplation, the Monk on the Seashore continues the beach theme, showing a hooded monk on the foreshore, just in front of the water, apparently lost in contemplation. Although the light shown behind the monk’s head might be the setting sun, red low in the sky to the right suggest that the sun is lower than that, and dusk is approaching. Jakub Schikaneder (1855–1924), Symbolic View (1895-97), further details not known. Wikimedia Commons. Schikaneder does seem to have painted a few symbolist works, including Symbolic View (1895-97). 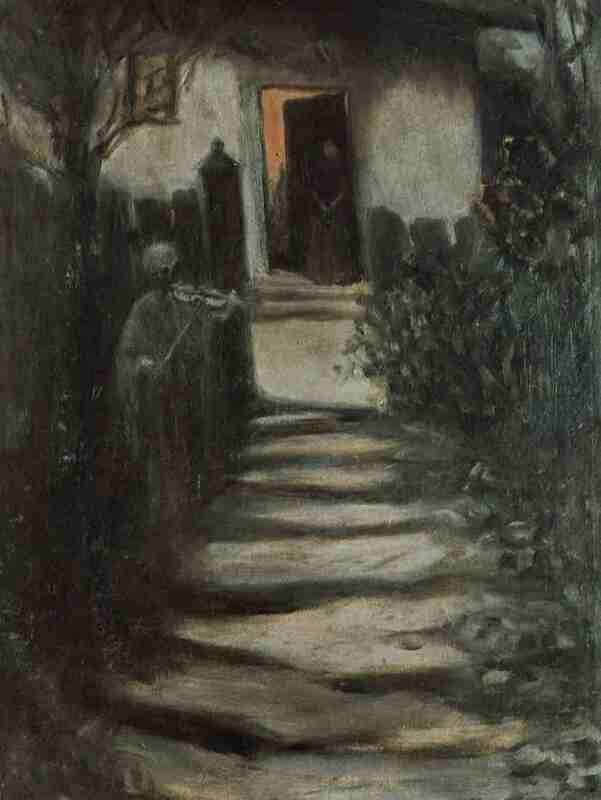 In the gathering dusk, the ghost of a violinist is playing his instrument at the side of the path leading up to a house, whose door is open. A woman stands just in front of the door, looking at the ghost. Jakub Schikaneder (1855–1924), Snow (Twilight in Winter) (1899), oil on canvas, 116 × 181 cm, Národní galerie v Praze, Prague, The Czech Republic. Image by Ophelia2, via Wikimedia Commons. 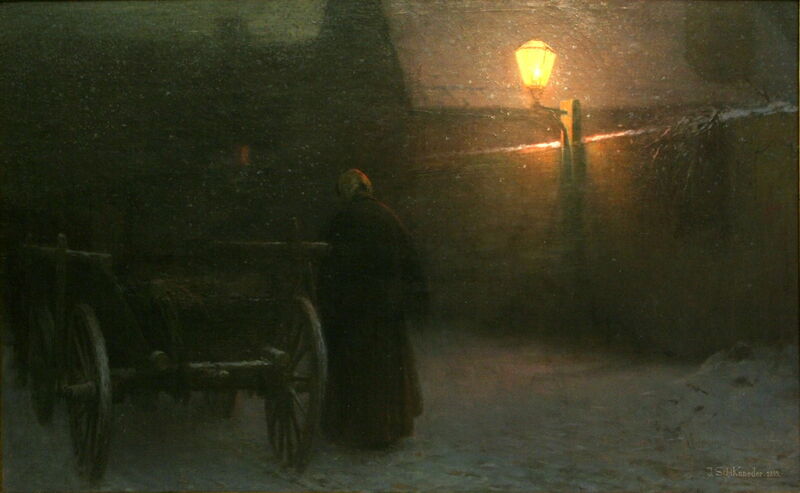 Snow (Twilight in Winter) (1899) is one of a number of Schikaneder’s paintings which show the serene desolation of the winter night in the town. Here a woman walks beside a horse and cart, past a street light. Posted in General, Life, Painting and tagged naturalism, painting, realism, Schikaneder, symbolism. Bookmark the permalink. Is it an artifact of the photography of the individual paintings, or are his horizons sometimes not level? He uses directional techniques rather convincingly; In The Sad Way, I struggle to fight the gravitational pull dragging me down off the left bottom corner of the page…particularly when there are wheels in slimy mud. It leaves me exhausted from the strain and sorrow of life. How does one pull on? I am particularly suffering for the horse. I’m thinking it is dawn in the Contemplation, rather than sunset. The sun may in fact be higher than the deep rose streaks to the right, and thinner clouds above are letting the rosy light in, especially as evidenced by the pale rose light reflected in the surf. While the light highlighting the monks head is not the sun, the pale light in the surf would not easily (optical dynamics) be reflection of his illumination, but that may still be what the artist is hoping for. Regardless, I think it is a good effort and nicely done. I don’t know about that horizon – in many online images it is artifactual. I also wish there was an easy way, without knowing which direction the view is looking, to tell the difference between sunrise and sunset. You may well be right. I will add that even without the slanted horizon in Drowned Woman, the downward slope of the meandering thin line of surf combined with the weight of the large rock (color, perceived substance, and the vertical lines of the rock’s reflection) all draw her back into the ocean, and then down into the depths, as emphasized by the horizontal pattern of the foam and debris beneath the rock’s shadow. She’s not going anywhere but back in; that rock makes sure of it. Her existence is impermanent and, as you say, Howard, rather ethereal…not long for this shore. Thank you – yes to all.